Sepp Blatter continued on from South Africa 2010 by taking the representation of the World Cup away from Europe in consecutive tournaments by opting to only allow South American countries the opportunity to put on the 2014 show. From the the southern half only two empires put their names into the fray, with both Brazil and Colombia looking to take on the feit by standing for candidacy. As the balloting began in March 2003; the Colombians applied in confidence. Meanwhile, Brazil’s history and international virtue, along with their domestic game prevailing, the recognition that football is part of the heartland saw them elected in October 2007, becoming the first South American hosts since 1978 and 2014 would also be the second time the country represented the game with their first being in 1950. From the lead up to Brazil’s selection, their promoters promised that the 2014 World Cup would become the most shielded in its journal, with more than £608.8m put aside to be invested into security forces. Twelve venues were used as £4.46bn was to be spent on stadiums, with five cities receiving new stadia, whilst renovations took place on the remaining. The famous final setting in Rio de Janeiro, the Maracana received a £750m boost to modernise its foundation although there was no increase on the 83,000 seat capacity. The original cost planned for the the stadiums stood at £7.44m, however a further £4.05bn was added to this sum to complete procedures. GoalControl 4D, a German company was given the go-ahead above English firm Hawk-Eye to implement goal-line technology into every stadium, installing 14 highly modified cameras in each ground, with seven aiming at each goal, forking out at £250,000 per site. Many demonstrators stood outside venues on a regular basis from the 2013 FIFA Confederations Cup, held in Brazil twelve months prior to the finals, with protesters unhappy with the amount of public money being spent on both tournaments within such a short space of time. There was an astronomical amount of excitement surrounding the venue of the final, escalating far beyond any build-up that the whole of South Africa accumulated four years preceding. The three-tiered sporting cathedral known as the Maracana has held a formidable story since the 1950 World Cup, where the Brazilians lost in unsuspecting fashion to Uruguay in front of a sold out, volume capacity of 173,850. The format of the World Cup back then, some 65-years-ago was very different to the current outlay, with the winners of four groups attending a final round which saw each team play each other in a league format. Whichever team stood at the summit after three games would be crowned champions. Brazil swept aside both Sweden and Spain, 7-1 and 6-1, whilst the Uruguayans scraped up to second after two matches with a 2-2 draw against the Spanish followed by a tight 3-2 victory over the Swedes. The Samba stars were the dominant force and intensely odds-on to lift only the forth World Cup trophy. Nevertheless, two goals in thirteen second-half minutes pulled a blanket of absent sound around the stadium and Brazil’s brashness was switfly banished. Death threats were propelled at the Brazilian team, in particular at goalkeeper Moacir Barbosa. Revisiting the noble venue was critical for Brazil in their selection process, in what promised to be one of most glorified finals in the World Cup hall of fame scrapbook. Further squabbling saw demonstrations boil, beginning with a number of referees being lambasted following under par performances domestically. Considering guarantees were made to make the tournament ultra safe, a number of breaches took place, most notably at the Maracana with one hundred Chile supporters infiltrating the gates during the South American’s group game victory over Spain, seeing 85 people detained. At the same stadium, twenty Argentinians repeated the crime in an attempt to see their country take on Bosnia Herzegovina. The safety of workers was also under scrutiny following the deaths of eight migrant project builders after a series of disasters which encountered fire, stadium break-ins and unstable staircases all reported at the Maracana. Two people were reported dead along with twenty-two injured following an unfinished monorail, which collapsed in Belo Horizonte onto a busy carriageway below. Constant anxieties with the weather were followed by worries with Brazil’s crime ratings and bothersome travel arrangements. Rio has had a reputation for felony, whilst Manuas suffered from being the furthest north in terms of location, high in the Amazon rainforest, with a route stretching 2,332.67 miles from the city with the statue of Christ. Rather interestingly, the mayor of Manaus did not want a new stadium, the Arena da Amazonia, which caused further questioning over its choice. The heat also caused dismay with average area temperatures for the year spanning between 72-79 degrees Fahrenheit, whilst in the northeast humidity would reach to highs of 100 degrees Fahrenheit. Cooling breaks were suggested of up to thirty minutes for games, with the only circumstance being held for protection purposes from the hot spells was the Last 16 tie between Netherlands and Mexico in Fortaleza. The contest itself flaunted some of the finest international football ever displayed. In the elementary stages of the group games, the first sixteen matches, 49 goals were scored in one of the most frantic openings to a World Cup. In the whole of the group stages 135 goals were netted, 35 were converted in the knockout stages, a total tournament collection of 219 in 64 games, with only seven goal-less draws. The first 0-0 scoreline came in the twelfth game between Iran and Nigeria in Group F, held in Curitiba. As the competition progressed and goals began to cease due to teams turning more cautious defensively, possession football became the pinnacle of importance. The group stages did not disappoint with three major exits, including one of the elites Spain. 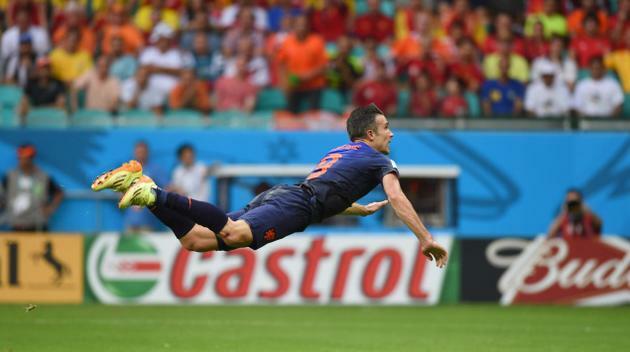 The 2010 winners lost their first game in Group C to the Netherlands in embarrassing form, scoring just the one and conceding five, including a super-man style flying header from Robin van Persie, assisted from a long cross-field ball from Daley Blind. Game two for La Roja also ended in hysteria, with opponents Chile sinking the Spanish by two goals from Eduardo Vargas and Charles Aranguiz in the first half. Despite a 3-0 victory over a young Australian side the Spanish were already out after two games, the first time a reigning champion had been eliminated after just 180 minutes of football. The two other major drop-outs came at the expense of Group D with both Italy and England falling short to surprise quarter-finalists Costa Rica and a deadly Uruguayan side. England went into the tournament without much expectation from the media and their supporters, however, this quickly built up with a young talented 23-man squad chosen by Roy Hodgson. As it turns the Three Lions played in reserved fashion, conceding twice to the Italians in Manaus including a winner from Mario Balotelli which cancelled out Wayne Rooney’s first ever World Cup goal. 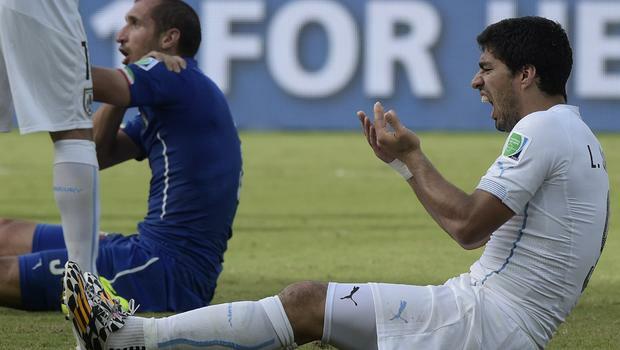 A half fit Luis Suarez added some brace to the Uruguayan to send England out after just two games, becoming only the fourth team to be cancelled out behind Cameroon, Spain and Australia. Their final group game ended with a dismal 0-0 outing against Costa Rica, recording a solitary point from a possible nine. The Italians failed to follow on from their confident win over Roy Hodgson’s side with two successive defeats, losing 1-0 to a well coordinated Costa Rican side, before going head-to-head with Uruguay in Natal. The Azzuri didn’t make things easy for themselves against the South Americans after Claudio Marchisio was dismissed for a professional foul on Edigio Arevalo in the second half, before Diego Godin rose to head in Gaston Ramirez’s corner to win the tie and send the Italians packing. The match was unfortunately cascaded by an altercation two minutes before the scoreline was edited between Luis Suarez and Giorgio Chiellini. After a dual challenge in the Italian box, it was made clear in the opinion of Juventus defender Chiellini that the new Barcelona striker had imbedded a bite mark on his shoulder. Mexican referee Marco Antonio Rodriguez claimed to miss the incident despite Chiellini illustrating teeth imprints along with his shirt being ripped. Suarez went without being penalised after somehow convincing the officials that it was a hapless collision, with the striker coincidently holding his teeth in ‘agony’. The fiendish forward did not go without punishment. FIFA took swift, evasive action to suspend him from the rest of the 2010 World Cup before allocating a four month ban along with a fine of £100,000. His defiant reputation preceded him due to previous biting incidences; whilst at Ajax with PSV Eindhoven midfielder Otman Bakkal which he was awarded a seven game ban and also with Chelsea defender Branislav Ivanovic during his time at Liverpool which saw him dismissed for ten matches. Although Suarez initially declined any recollection of his chomp on Chiellini, a formal apology was belatedly made to the Italian. His appeal was later overturned to allow him to train and play in friendly games with his new Catalonian teammates, despite initial rejections to allow him to take part in all forms of football. Further outbreaks of unsociable behaviour flared with Ghana in a player revolt over pay and issues between the players and management. The government had to send a £3million payment to stop the players from boycotting their final group game against Portugal. Other aspects such as simulation are now expected in the modern game, however a thirty minute cooling break due to the hot weather did not stop the frolics of Netherlands winger Arjen Robben in their Last 16 tie against Mexico in the La Verde, who, with a stupendous dive in the penalty box, ‘won’ an opportunity from 12-yards for the Orange Army in the 94th minute. Klaas-Jan Huntelaar converted from the spot above the heat of criticism. Robben later owned up to his cheating sins. On a more positive note we saw the growth of both divisions of the North and South American divide. Colombia desired for great things, almost stopping the Brazilians in their tracks to a semi-final spot. Although they had Radamel Falcao on the sidelines with injury, the World Cup brought the name James Rodriguez to the forefront after being named the winner of the golden boot award, including a stunning 25-yard volley in-off the underside of the crossbar after controlling the ball on his chest. The growth of football in America also took a turn for the better with Jurgen Klinsmann’s side initially written off, making the Last 16, a game which saw them narrowly lose out to Belgium. Television viewings for this set the highest watched sporting event in United States history, some feit considering the popularity of the Super Bowl. The most iconic factor was the run of hosts Brazil. Usually a side best characterised for their swift, attacking samba style and trickery, Filipe Scolari’s five-time World Cup champions failed to set any new milestones. Apart from a good run out against both Cameroon and Colombia noted as their best performances, the Verde-Amarela had difficulty in recapturing the form they displayed twelve months earlier in the 2013 FIFA Confederations Cup. The hardest result for them to swallow was to Germany, with supporters in tears and a defence that played with their shorts round their ankles, David Luiz and co shipped in seven goals in Belo Horizonte to a solitary one. The semi-final was supposed to have been a game that brought good news to captain Neymar, who suffered from a fractured vertebra in the previous match against Colombia following a reckless challenge from Juan Camilo Zuniga late in the game. However, Brazil were embarrassed and torn apart for what they truly were. To be branded as one of the teams to beat was a flawed expectation. The gold trophy was to be awarded to the Germans which, on the basis of their overall pitch persona and performance, saw them become deserved winners, not just for the seven they put past the hosts which saw them score five in the first twenty-nine minutes. One of the goals included Miroslav Klose’s new World Cup goal scoring record, toppling former Brazilian forward Ronaldo’s previous number. Joachim Low’s had a group of players at his disposal who had grown up in the same generation and finally built up substantial practice at international level to achieve the feet many thought that they had in them. The Nationalelf became the competition’s top goalscorers with eighteen, which on top of the 7-1 overhaul of Brazil, the champions also recorded a 4-0 whitewash of Portugal in the group stages, whilst only conceding five throughout the competition with an assured defence. Captain Phillipe Lahm was a true organiser, Mats Hummels cleared ball after ball with the rest of his back-line, whilst Thomas Muller converted efficiently up front. It took the Germans a total of 113 minutes to add the defining blow to a resilient Argentinean side, with the likes of Lionel Messi, Gonzalo Higuain and Angel Di Maria in the ranks, as Mario Gotze’s stretching volley sealed a fourth World Cup title. It was to be a score-line that would replicate the 1990 final which laid claim to the very same nations. One visible feature that began to give the tournament its true complexion was the party atmosphere, which started a week or so before the opening ceremony and carried on throughout the competition. Rio’s Copacabana beach became renowned for its scintillating rich colour and high definition entertainment, from the rise of the midday to the early hours of next moonlit morning, accumulating hundreds among thousands of people from all nationalities. Brazil 2014 became known for being the highest travelling South American visit to the continent for a sporting event. It did however become known for being an event for the wealthy, with super expensive tickets. Only 400,000 of the 3.3 million tickets sold were allocated to local Brazilian fans. Many accused Brazil of social and economical misuse having felt the cost of the event could have been invested in education, healthcare and infrastructure improvements. With tourist figures anticipated to mount the 10 million mark by 2020, six years beyond the 2014 World Cup, the government will be expected to spend the gross profit wisely, to decrease crime and poverty in the towns and to build from within the country’s roots despite football being considered a religious cult. The total dividend the country received for a month’s worth of hosting was £2.97bn, a record in the World Cup record books. FIFA awarded a grand total prize money of £23.7m and a sum of £39bn across all 32 teams. 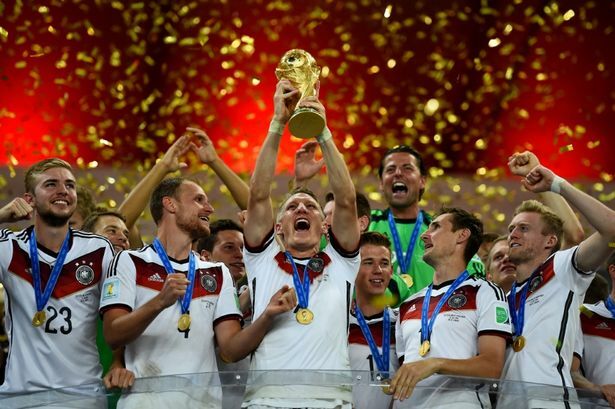 The revenue from television was simply astonishing with several games qualifying to be the most watched football scene in history, with the final between Germany and Argentina toppling the rest with ratings of 34.7 million. Brazil 2014 became the most watched but most expensive sporting event of all time. The football itself had a colourful radius to coincide with the visuals in the crowds and outside entertainment, although some of the strongest teams in the competition, especially the Germans benefited from players revelling together regularly in strong coherent leagues. Germany’s triumph capped the first time a European country lifted the biggest prize in international football on Latin American soil and also that three European countries recorded three World Cup wins on the bounce, with Italy winning in 2006 and Spain in 2010. Brazil 2014 helped engage people in complimenting the return of purity to international football, reconfirming its slant as an eminent feature of the sport. One aspect that was confirmed on a weak note was the handling of injuries, particularly on head knocks, something that has been of concern over the past twelve or so months in football. Uruguay’s Alvaro Pereira lay unconscious before being signalled by his management and the referee to continue despite calls from team doctors to ring in a substitution. Another worrying dismissal of player neglect by those responsible for their health and safety was seen in the final. Borussia Monchengladbach’s midfielder Christoph Kramer, on loan from Bayer Leverkusen played his one and only game for Germany in the finale, received a blow to the head in a forteenth minute collision but was waved on to persist despite looking clearly shaken. After thirty-one minutes Kramer collapsed as a result of the impact, he was soon to be substituted after referee Nicola Rizzoli revealed that the defensive midfielder went on to ask if it was the World Cup final that evening. Other interesting encounters saw the simple revelation of vanishing spray coming to the foray. The foam liquid was introduced for match officials on the field to use as a marker to restrict defenders from infiltrating the yardage given between them and the ball during a set play. The foam became a hit with some of the top domestic league competitions around the world. The spray has expanded in its usage by being seen in the Premier League, the FA and League cups, plus in UEFA based competitons, the Champions League and Europa League. Another follow on was the summer transfer window which became the most expensive market recorded since its reinvention in during the 2002-03 season. Although the natives are unhappy with the cost of Brazil 2014, seven months on and the signs of a legacy are for the most part more positive than negative. It will take a number of years until the tournament can be judged as one of the greats with future World Cups on the horizon, however for the time being, Brazil 2014 can consider itself a success and a competition that sits well on the mantel piece alongside some of the best ever held, including Italia 90 which tends to claim it’s thrown above the rest by the majority opinion.